Until next summer, a visit to the Science Museum in London can be more than a thrilling experience. Among seven floors of exhibitions, it can be found in the basement the new Google Web Lab, which is running until June 2013 online and inside the museum. It consists of five interactive installations and they are also part of a Google initiative called Chrome Experiments, an open and worldwide showcase for creative experiments on the internet. As we enter the room, the first impression is to think that Google Web Lab is a laboratory indeed. The room is full with projections, cameras, robots and computers. The first step is to receive a card with a code. This is the ID to all Google experiments at the museum, and it saves all content created there. After leaving, we simply use the same code in the Google Web Lab site and the show goes on. There, we do not play alone and all the interactivity is made virtually. Visitors play with internet users and vice versa, so you can still visit the exhibition even if you’re not in London. In the entrance, there is also a glass room with an office. There, Google engineers can work careful on each installation, analyze data that comes on-line and also improve or fix the machines. Their goal is to show through the interactivity how internet can be extraordinary and inspiring. Indeed, although some people may find some experiments quite confusing initially, the “magic” appears as soon as they start to play. Children and teenagers, on the other hand, seem particulary comfortable with the machines and this is exactly what Google wants with this exhibition: inspire the next generation of computer scientists and enthusiasts. Here is a short description of each experiment inside Google Web Lab. Unfortunately, when I was there last August, two of them were under maintenance (Teleporter and the Data Tracer), but I could still learn about how they operate through videos available. Later, I also had the chance to use them on-line. Where do you want to be? Nowadays, with Google Maps tracing all paths in the world (or even the Amazon River! ), it seems quite simple to be in different places at the same time. However, how could we improve this experience? With the Teleporter, visitors can see through web-enabled periscopes and take a look in three different places: a 24-hour bakery in North Carolina, Unite States; an aquarium in South Africa and miniature model airport in Hamburg, Germany. They all have a 360° live camera so we can see action all around. If you are an online visitor, you also can see people using the Teleporter by watching the feed inside the museum. Then, Google explains the project and shows how video and image compression works. 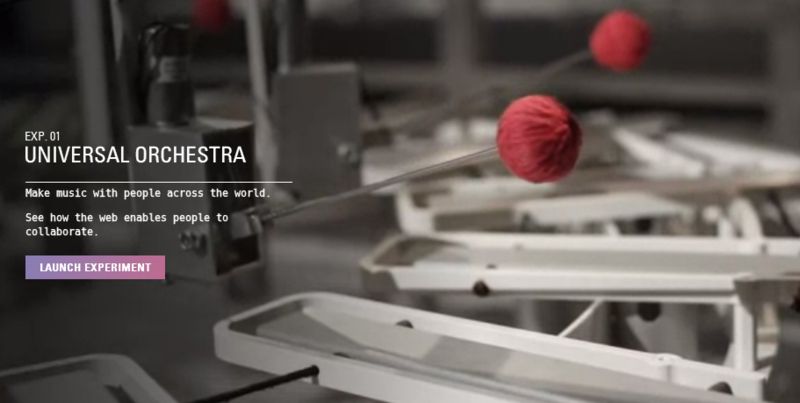 To explain how real time collaboration works, Google decided to create an internet-powered eight-piece robotic orchestra. The challenge is to create harmonious music with people from different parts of the world. The visitor select the notes, the computer process it with other notes provided by online visitors and send it to the instruments, which play live music in the museum. “The Universal Orchestra allows people to make music with each other through the internet. So, you can have people in one instrument in the museum and then have another instrument being played online by, literally, somebody next to them ”, explains Steve Vranakis, Creative Director from Google Lab. Lab Tag Explorer: would you like to be found? 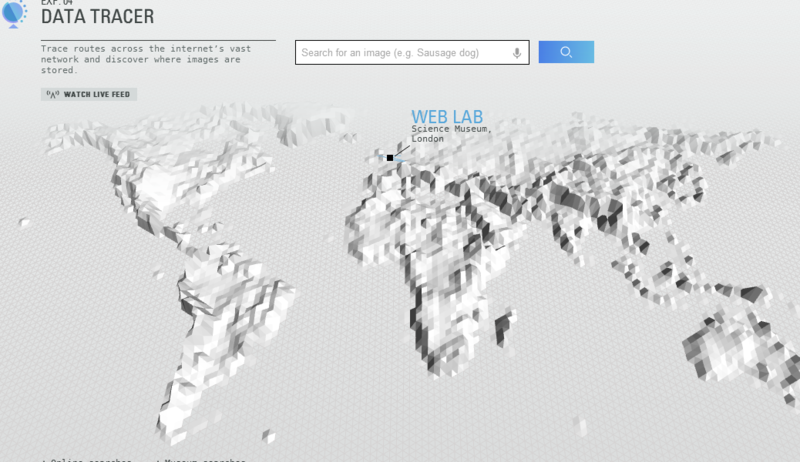 In this real-time visualization, all Web Lab participants from around the world come together. They become organized in groups and are categorized in many different manners. Inside the museum and online, we can see where do people come from and check out their profile to see what sort of experiment they used and how they used. They main goal of the Lab Tag Explorer is to show how data basis works, how content can be organized and visualized in a comprehensible way. In addition, people can learn how beneficial it is to tag the content and use search browsers in the fastest way. Sketchbots: your photo in the sand, drawn by a robot! Data Tracer: where is online information physically stored? The main objective of the Data Tracer is to show how all kinds of data travels across the web through network systems. In a 3D map, visitors can search for an image by typing keywords. Then, they can see where in the world the information came from in just few seconds. In order to reach all kinds of visitors with different ages and backgrounds, Google created special videos and tutorials to show them how does the technology inside a computer works. With an accessible language, metaphors, comparisons and examples, Google explains what is behind software and languages such as HTML5. To increase visitors participation, the company launched the ‘Beta’ Lab, so users can be part of the creative process and send feedback about the experiments. This is also essential to Google engineers who are working inside the Lab for further improvements. Open online and in London at the Science Museum (physical exhibition from 10am to 6pm) until June 2013. Entry is free.